I went to the library today intending to pick up another Stephen King book but then I thought, “Well, I’ve already read 2 of his books recently…” so I started browsing and picked up a book by Haruki Murakami that looked good and I hadn’t read. He’s a great author to check out by the way. Still, I couldn’t decide. I put the Murakami back and went over to the Asimov section. Foundation… I, Robot… Hmmm. 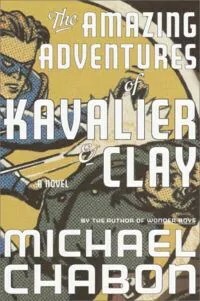 Then it hit me, Michael Chabon’s The Amazing Adventures of Kavalier and Clay. I’ve been wanting to try out one of his books for a while ever since I saw the movie Wonder Boys a few years ago. Great movie based on his second novel. So, I got this book and am now some 50 pages or so into it and enjoying it immensely. Tomorrow, I’m dedicating a good chunk of time to my secret project which I will unleash upon the world very soon. Muhahahhah. Ok, nothing sinister really.